Most Arctic icebergs originate from the fast-flowing glaciers that descend from the Greenland Ice Sheet. Many glaciers are funneled through gaps in the chain of coastal mountains. The irregularity of the bedrock and valley wall topography both slows and accelerates the progress of glaciers. These stresses cause crevasses to form, which are then incorporated into the structure of the icebergs. Arctic bergs tend to be smaller and more randomly shaped than Antarctic bergs and also contain inherent planes of weakness, which can easily lead to further fracturing. If their draft exceeds the water depth of the submerged sill at the mouth of the fjord, newly calved bergs may stay trapped for long periods in their fjords of origin. Such an iceberg will change shape, especially in summer as the water in the fjord warms, through the action of differential melt rates occurring at different depths. Such variations in melting can affect iceberg stability and cause the berg to capsize. Examining the profiles of capsized bergs can help researchers detect the variation of summer temperature occurring at different depths within the fjord. In addition, the upper surfaces of capsized bergs may be covered by small scalloped indentations that are by-products of small convection cells that form when ice melts at the ice-water interface. The Arctic Ocean's equivalent of the classic tabular iceberg of Antarctic waters is the ice island. Ice islands can be up to 30 km (19 miles) long but are only some 60 metres (200 feet) thick. The main source of ice islands used to be the Ward Hunt Ice Shelf on Canada's Ellesmere Island near northwestern Greenland, but the ice shelf has been retreating as ice islands and bergs continue to calve from it. (The ice shelf is breaking into pieces faster than new ice can be formed.) Since the beginning of observations in the 1950s, the Ward Hunt Ice Shelf has virtually disappeared. The most famous of its ice islands was T-3, which was so named because it was the third in a series of three radar targets detected north of Alaska. This ice island carried a manned scientific station from 1952 to 1974. Ice islands produced by Ellesmere Island calve into the Beaufort Gyre (the clockwise-rotating current system in the Arctic Ocean) and may make several circuits of the Canada Basin before exiting the Arctic Ocean via Fram Strait (an ocean passage between Svalbard and Greenland). A third source of ice islands, one that has become more active, is northeastern Greenland. The Flade Isblink, a small ice cap on Nordostrundingen in the northeastern corner of Greenland, calves thin tabular ice islands with clearly defined layering into Fram Strait. Observations in 1984 showed 60 grounded bergs with freeboards of 12-15 metres (40-50 feet) off Nordostrundingen in 37-53 metres (120-175 feet) of water. 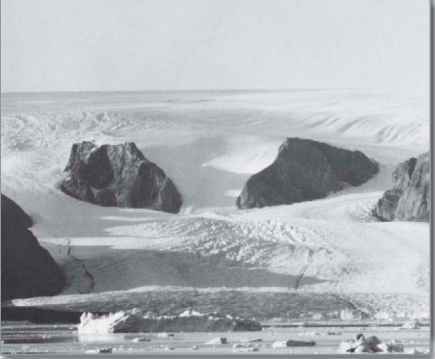 Similar bergs acted as pinning points for pressure ridges, which produced a blockage of the western part of Fram Strait for several years during the 1970s. 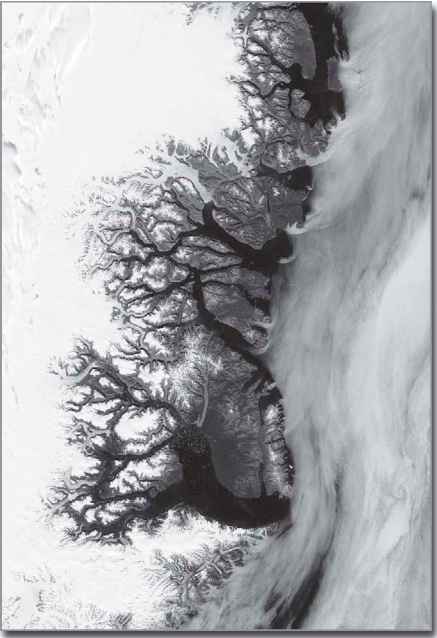 In 2003 the multiyear cover of fast ice along the northeastern Greenland coast broke out. This allowed a huge number of tabular icebergs to emerge from the fast-flowing Nioghalvfjerdsfjorden Glacier and Zachariae Isstrom in northeastern Greenland. Some of these reached the Labrador Sea two to three years later, while others remained grounded in 80-110 metres (260-360 feet) of water on the Greenland shelf. A newly calved Antarctic tabular iceberg retains the physical properties of the outer part of the parent ice shelf. The shelf has the same layered structure as the continental ice sheet from which it flowed. All three features are topped with recently fallen snow that is underlain by older annual layers of increasing density. Annual layers are often clearly visible on the vertical side of a new tabular berg, which implies that the freeboard of the iceberg is mainly composed of compressed snow rather than ice. Density profiles through newly calved bergs show that at the surface of the berg the density might be only 400 kg per cubic metre (25 pounds per cubic foot)—pure ice has a density of 920 kg per cubic metre (57 pounds per cubic foot)—and both air and water may pass through the spaces between the crystal grains. Only when the density reaches 800 kg per cubic metre (50 pounds per cubic foot) deep within the berg do the air channels collapse to form air bubbles. At this point, the material can be properly classified as "ice," whereas the lower- density material above the ice is more properly called "firn." Corresponding to a layer some 150-200 years old and coinciding approximately with the waterline, the firn-ice transition occurs about 40-60 metres (130-200 feet) below the surface of the iceberg. Deeper still, as density and pressure increase, the air bubbles become compressed. Within the Greenland Ice Sheet, pressures of 10-15 atmospheres (10,100-15,200 millibars) have been measured; the resulting air bubbles tend to be elongated, possessing lengths up to 4 mm (0.2 inch) and diameters of 0.02-0.18 mm (0.0008-0.007 inch). In Antarctic ice shelves and icebergs, the air bubbles are more often spherical or ellipsoidal and possess a diameter of 0.33-0.49 mm (0.01-0.02 inch). The size of the air bubbles decreases with increasing depth within the ice. As ice depth increases to 12 metres (40 feet) and beyond, the temperature difference between icebergs and ice shelves is negligible. Encyclopedia Britannica, Inc.
is contained in the "cold core" below sea level, where temperatures remain at -15 to -20°C (5 to -4°F). In the cold core, heat transfer is inhibited owing to the lack of percolation and refreezing. For many years, the largest reliably measured Antarctic iceberg was the one first observed off Clarence Island (one of the South Shetland Islands) by the whale catcher Odd I in 1927. It was 180 km (110 miles) long, was approximately square, and possessed a freeboard of 30-40 metres (100130 feet). In 1956 an iceberg was sighted by USS Glacier off Scott Island (a small island about 500 km [300 miles] northeast of Victoria Land in the Ross Sea) with unconfirmed length of 335 km (210 miles) and width of 100 km (60 miles). However, there have been many calvings of giant icebergs in the Ross and Weddell seas with dimensions that have been measured accurately by satellite. In 2000 iceberg B-15 broke off the Ross Ice Shelf with an initial length of 295 km (about 185 miles). Although B-15 broke into two fragments after a few days, B-15A—the larger portion, measuring 120 km (75 miles) long by 20 km (12 miles) wide—obstructed the entrance to McMurdo Sound and prevented the pack ice in the sound from clearing out in the summer. In October 2005 B-15A broke up into several large pieces off Cape Adare in Victoria Land because of the impact of distant swell. Iceberg C-19 was an even larger but narrow iceberg that broke off the Ross Ice Shelf in May 2002. It fragmented before it could drift far. Although these events received much attention and were thought to be symptomatic of global warming, the Ross Sea sector does not seem to be warming at present. It is likely that the emission of giant icebergs in this zone was an isolated event. Intense iceberg outbreaks, such as the one described above, may not necessarily be occurring with a greater frequency than in the past. Rather, they are more easily detected with the aid of satellites. In the typically ice-free Southern Ocean, surveys of iceberg diameters show that most bergs have a typical diameter of 300-500 metres (1,000-1,600 feet), although a few exceed 1 km (0.6 mile). It is possible to calculate the flexural (bending) response of a tabular iceberg to long Southern Ocean swells, and it has been found that a serious storm is capable of breaking down most bergs larger than 1 km into fragments. Arctic bergs are generally smaller than Antarctic bergs, especially when newly calved. The largest recorded Arctic iceberg (excluding ice islands) was observed off Baffin Island in 1882; it was 13 km (8 miles) long by 6 km (4 miles) wide and possessed a freeboard, or the height of the berg above the waterline, of 20 metres (65 feet). Most Arctic bergs are much smaller and have a typical diameter of 100-300 metres (330-1,000 feet). Owing to their origin in narrow, fast-flowing glaciers, many Arctic bergs calve into random shapes that often develop further as they fracture and capsize. Antarctic bergs also evolve by the erosion of the weak freeboard or via further calving into tilted shapes. Depending on the local shape of the ice shelf at calving, the surfaces of icebergs, even while still predominantly tabular, may be domed or concave. 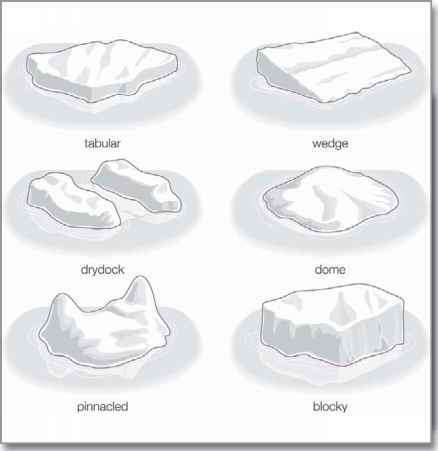 Icebergs are typically divided into six types. Encyclopedia Britannica, Inc.
wave cut that can penetrate for several metres into the berg. The snow and firn above it may collapse to create a growler (a floating block about the size of a grand piano) or a bergy bit (a larger block about the size of a small house). At the same time, the turbulence level is enhanced around existing irregularities such as cracks and crevasses. Waves eat their way into these features, causing cracks to grow into caves whose unsupported roofs may also collapse. Through these processes, the iceberg can evolve into a drydock or a pinnacled berg. (Both types are composed of apparently independent freeboard elements that are linked below the waterline.) Such a berg may look like a megalithic stone circle with shallow water in the centre. In the case of Arctic icebergs, which often suffer from repeated capsizes, there is no special layer of weak material. Instead, the whole berg gradually melts at a rate dependent on the salinity (the salt concentration present in a volume of water) and temperature at various depths in the water column and on the velocity of the berg relative to the water near the surface. International Ice Patrol. It has been suggested that if the melt rate could be reduced by interposing a layer of fabric between the ice and water, an iceberg could theoretically survive long enough to be towed across the Atlantic Ocean from Newfoundland to Spain for use as a water and power source. In Arctic icebergs, erosion often leads to a loss of stability and capsizing. For an Antarctic tabular berg, complete capsize is uncommon, though tiltmeter measurements have shown that some long, narrow bergs may roll completely over a very long period. More common is a shift to a new position of stability, which creates a new waterline for wave erosion. When tabular icebergs finally fragment into smaller pieces, these smaller individual bergs melt faster, because a larger proportion of their surface relative to volume is exposed to the water. In the Antarctic, a freshly calved iceberg usually begins by moving westward in the Antarctic Coastal Current, with the coastline on its left. Since its trajectory is also turned to the left by the Coriolis force owing to Earth's rotation, it may run aground and remain stationary for years before moving on. For instance, a large iceberg called Trolltunga calved from the Fimbul Ice Shelf near the Greenwich meridian in 1967, and it became grounded in the southern Weddell Sea for five years before continuing its drift. If a berg can break away from the coastal current (as Trolltunga had done by late 1977), it enters the Antarctic Circumpolar Current, or West Wind Drift. This eastward-flowing system circles the globe at latitudes of 40°-60° S. Icebergs tend to enter this current system at four well-defined longitudes or "retroflection zones": the Weddell Sea, east of the Kerguelen Plateau at longitude 90° E, west of the Balleny Islands at longitude 150° E, and in the northeastern Ross Sea. These zones reflect the partial separation of the surface water south of the Antarctic Circumpolar Current into independently circulating gyres, and they imply that icebergs found at low latitudes may originate from specific sectors of the Antarctic coast. Once in the Antarctic Circumpolar Current, the iceberg's track is generally eastward, driven by both the current and the wind. Also, the Coriolis force pushes the berg slightly northward. The berg will then move crab-wise in a northeasterly direction so that it can end up at relatively low latitudes and in relatively warm waters before disintegrating. In November 2006, for instance, a chain of four icebergs was observed just off Dunedin (at latitude 46° S) on New Zealand's South Island. Under extreme conditions, such as its capture by a cold eddy, an iceberg may succeed in reaching extremely low latitudes. For example, clusters of bergs with about 30 metres (100 feet) of freeboard were sighted in the South Atlantic at 35°50' S, i8°05'E in 1828. In addition, icebergs have been responsible for the disappearance of innumerable ships off Cape Horn. broken pack ice are left as the bergs move past the obstacles. Other bergs pass through Fram Strait and into the East Greenland Current. As these icebergs pass down the eastern coast of Greenland, their numbers are augmented by others produced by tidewater glaciers, especially those from Scoresby Sund. Scoresby Sund is an inlet that is large enough to have an internal gyral circulation. Water driven by the East Greenland Current enters on the north side of the inlet and flows outward on the south side. This pattern encourages the flushing of icebergs from the fjord. In contrast, narrower fjords offer more opportunities for icebergs to run aground; they also experience an estuarine circulation pattern where outward flow at the surface is nearly balanced by an inward flow at depth. An iceberg feels both currents because of its draft and thus does not move seaward as readily as sea ice generated in the fjord. As the increased flux oficebergs reaches Cape Farewell, most bergs turn into Baffin Bay, although a few "rogue" icebergs continue directly into the Labrador Sea, especially if influenced by prolonged storm activity. Icebergs entering Baffin Bay first move northward in the West Greenland Current and are strongly reinforced by icebergs from the prolific West Greenland glaciers. About 10,000 icebergs are produced in this region every year. Bergs then cross to the west side of the bay, where they move south in the Baffin Island Current toward Labrador. At the northern end of Baffin Bay, in Melville Bay, lies an especially fertile iceberg-producing glacier front produced by the Humboldt Glacier, the largest glacier in the Northern Hemisphere. 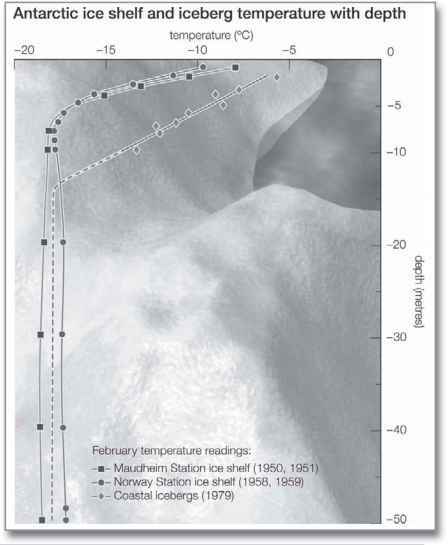 Graph of the change in iceberg number with decreasing latitude in the Northern Hemisphere. Encyclopedia Britannica, Inc.
embedded in winter sea ice. 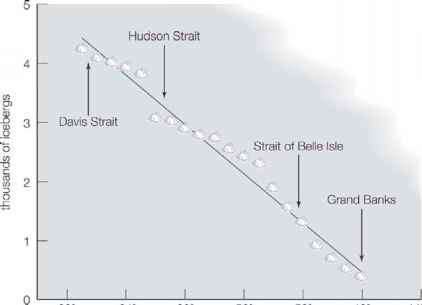 The flux of bergs that emerges from Davis Strait into the Labrador Current, where the final part of the bergs' life cycle occurs, is extremely variable. The number of bergs decreases linearly with latitude. This reduction is primarily due to melting and breakup or grounding followed by breakup. On average, 473 icebergs per year manage to cross the 48° N parallel and enter the zone where they are a danger to shipping—though numbers vary greatly from year to year. Surviving bergs will have lost at least 85 percent of their original mass. They are fated to melt on the Grand Banks or when they reach the "cold wall," or surface front, that separates the Labrador Current from the warm Gulf Stream between latitudes 40° and 44° N.
Much work has gone into modeling the patterns of iceberg drift, especially because of the need to divert icebergs away from oil rigs. It is often difficult to predict an iceberg's drift speed and direction, given the wind and current velocities. An iceberg is affected by the frictional drag of the wind on its smooth surfaces (skin friction drag) and upon its protuberances (form drag). Likewise, the drag of the current acts upon its immersed surfaces; however, the current changes direction with increasing depth, by means of an effect known as the Ekman spiral. Another important factor governing an iceberg's speed and direction is the Coriolis force, which diverts icebergs toward the right of their track in the Northern Hemisphere and toward the left in the Southern Hemisphere. This force is typically stronger on icebergs than on sea ice, because icebergs have a larger mass per unit of sea-surface area. As a result, it is unusual for icebergs to move in the same direction as sea ice. Typically, their direction of motion relative to the surface wind is some 40°- 50° to the right (Northern Hemisphere) or left (Southern Hemisphere). Icebergs progress at about 3 percent of the wind speed.